If you live in Leytonstone and waste is getting you down, reach out to Away With It today. 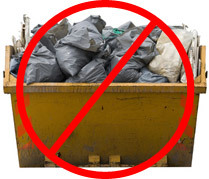 With two skip hire services available, you can rest assured that we have the perfect waste removal service for you. Better still, we can tailor solutions to suit your budget and specific needs. Residential or commercial property, get in touch today for Leytonstone skip hire. Particularly for those who haven’t hired a skip before, the concept can seem confusing and daunting. Away With It take all this stress away and we will figure out the logistics and permits needed for your scenario. Furthermore, as licensed and insured waste removal professionals, you can have peace of mind that we follow all laws and legislations to the letter. 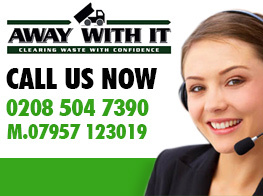 At Away With It, we also take into the consideration the environment when carrying out waste removal. We recycle 80% of waste removed from jobs across all of our services. Having a skip sitting on your drive for a week or so can be extremely handy. Being able to fill the skip at your own pace and having access to it 24/7 can be an appealing option to some of our customers. However, traditional skip hire doesn’t suit all budgets and circumstances. For this reason, and unlike other skip hire companies, Away With It have an alternative option. Our two-man waste removal teams are ready to hop in their special company vehicles and head to your property now. 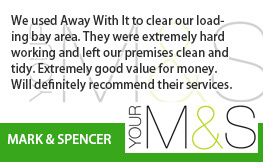 They will take your waste away there and then, leaving your property tidy on departure. If you would like more information on our skip hire services, you only need give one of our friendly advisors a call today on 0208 504 7390. They will be able to answer any queries you have and provide advice to help you make the best decision. How many companies do you know that are open between 7am and 11:30pm, 7 days per week? We don’t want you to waste annual leave days or have to arrange child care simply so you can wait for a skip hire service. 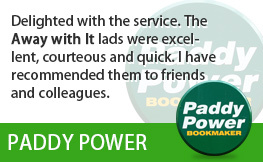 We tailor our service to the needs of our customers. When you settle on a service and want to book in, the date and time is completely up to you. Sometimes, jobs permitting, we can even do same day! 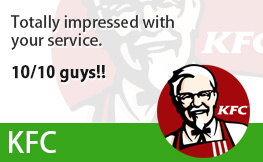 If not, we will provide you with a guaranteed two-hour time slot when it best suits you. 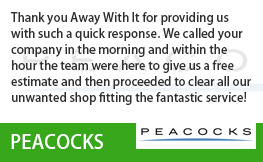 Also, when our team are on their way to you, they will give you a quick ring to let you know they will be arriving soon. Whatever your skip hire needs, get in touch with Away With It today. 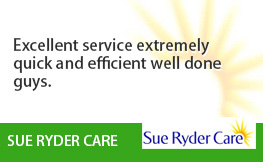 When it comes to efficiency, affordability and friendliness, there is no better skip hire company to go with. 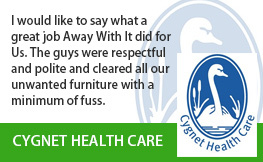 To get the ball rolling, call us today on 0208 504 7390.